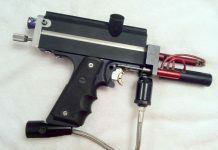 A short video and closer look at a 1994 Pacific Paintball Autococker likely cut by Chris Haggin. 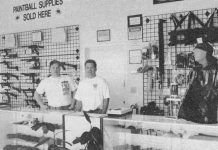 A scan from the January 1993 issue of Action Pursuit Games gives a small write up on Pacific Paintballs operation at the end of 1992. 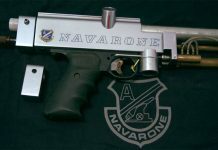 A Navarone Autococker back block I found forsale on facebook will go on Navarone #19 which I found incomplete. 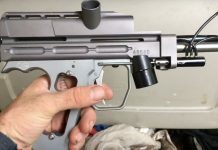 I still need the front block and shroud. 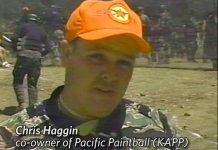 Chris Haggin of Pacific Paintball and Kapp discusses some information on paintball players in an early interview from Paintball Hill's Store Wars, 1992. 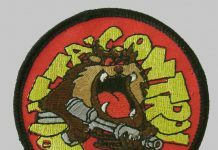 An Outta Control patch that Glenn Palmer had from the early to mid 90s. 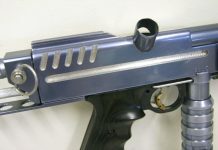 And Tony Meno adds some details on the players of Outta Control. 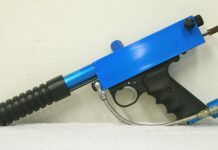 A neat custom Sniper 3 supposedly cut by Jeff Orr and debuted at the 94 masters then sold to Chris Haggin of Pacific Paintball. 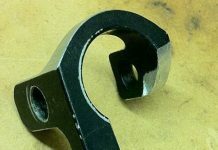 A crazy styled Kapp P Block that I received with some prototype Kapp Autococker parts from Ryan Podesta. 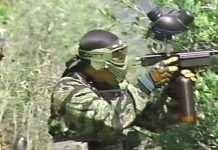 Billy Wing confirmed he did the work on this Pacific Paintball / Kapp Minicocker from the mid 90s.